Do you ever wonder what types of unspoken fears run through the mind of your child? 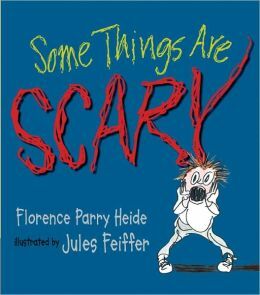 Some Things Are Scary by Florence Parry Heide is a great tool for opening up a dialog about just that. Lighthearted illustrations by Jules Feiffer intermixed with a bit of pure silliness make talking to your kids about some very real fears not so scary at all. Have you ever thought to yourself, “What if I had been born a hippopotamus?” Yeah, me neither. But if I HAD, that certainly could be scary. Kidding aside, Some Things Are Scary offers plenty of real and relatable moments from childhood that can leave the bravest among us frightened, even if only a little. • Skating downhill when you haven’t learned how to stop. • Being on a swing when someone is pushing you too high. Scary, but in a good way. • Being with your mother when she can’t remember where she parked the car. Sorry moms. That’s scary too. Some of the more fanciful fears in this book will make you laugh. Others will tug at your heart as you remember experiencing that very same scary moment, or know that your own child has had a similar fear. Fair warning, this book does not offer any happy resolution at the end. In fact, when taken as a whole and without any further discussion, a highly anxious child might conclude that life is scary, period. Not only that, it’s time to go crawl under a rock. Even if you find that talking about feelings with your child is scary this book offers a great opportunity to learn more about his or her inner world. Besides, if you’re a parent then by default you’ve already had every fear imaginable. Approaching this subject shouldn’t be scary at all! Okay, maybe a little. If you’ve enjoyed this quick children’s book review, please feel free to share!